This drum tap fits our 20L cubes, fresh wort kits and other drums/bottles. They all have a opening diameter of 58mm. These are a fantastic solution for leak free storage and easy dispensing of our cleaning chemicals. All you need to do is unscrew the lid and screw one of these on. Then tip the drum on its side and turn the tap to dispense. This tap has an inbuilt breather so it lets the air back into the drum as the liquid drains out. It saves you having to open the bung at the bottom. Once you are finished dispensing, turn the tap off and it will never leak. 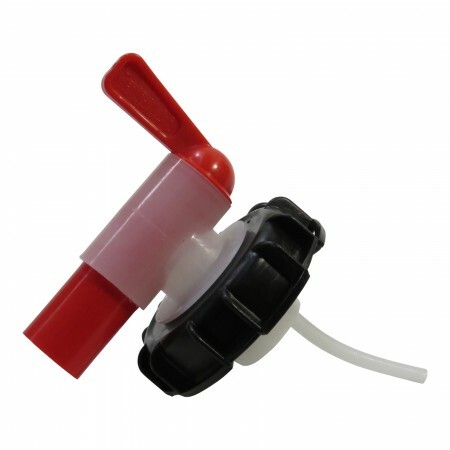 The Tap in a Cap - 58mm, allows you to use your water cube to fill up drink bottles and cups with ease.